In five years time, this could probably have been a great picture. The somewhat twisted grammar of that sentence is largely explained by the knowledge that its biggest flaw is the computer graphics snake, which ranges from the acceptable to the laughable; some things are still better off done with latex and pneumatics. That’s a shame, as the rest of the film isn’t anywhere near as bad, being cheerful and lively with Voight memorably snaky himself, playing a hunter who hijacks a documentary film crew and their boat up the Amazon. Danny Trejo (killed inside five mins) and Stoltz (unconscious for most of the movie) are severely underused, leaving the field clear for the rest of the tiny cast, notably Lopez and Jonathan Hyde. 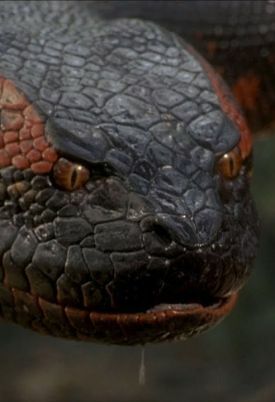 There’s an occasional nod to Werner Herzog, and the snake attacks are great set-pieces, well written and directed with pace and vigour, if not perhaps great herpetological accuracy. Just a pity the monster’s bark is far better than its byte.